You may have read my blog post a couple of months ago about women’s product development at Specialized. I also made contact with a few other companies at the same time and so here’s the women’s development story from Trek. I would have preferred to have spoken to someone from Trek, instead here’s some Q&A via email from Emily Bremer who is based at Trek HQ in the US and among other roles is responsible for the marketing of women’s products. How many people at Trek work on women’s product development? Are they all women? 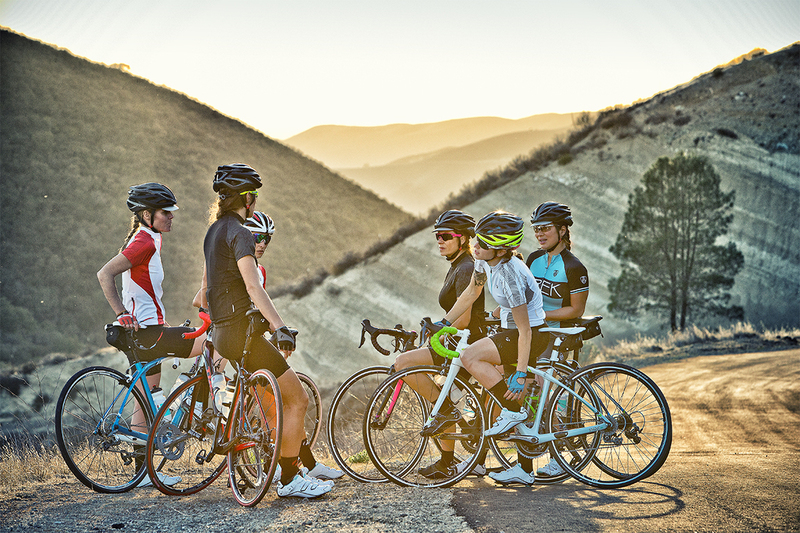 Women’s specific product development at Trek is a group effort, and certainly not done just by women. From industrial designers, to engineers, to marketing, and everything in between, women’s product development across categories is a top priority, and I think this is really reflected in the quality of Trek products. Trek is a global company, so it’s really hard to pinpoint a specific number of people working on our women’s specific product. Both men and women work on all Trek and Bontrager products, regardless of riding category or gender. What product categories have women’s only products? Every product category has women’s products at Trek. From Silque (road), to Cali (Mountain), and the Chelsea (City), with many others in the mix as well. A full list of products and information can be found by viewing our women’s collection page. Why do you develop women’s only cycling products? I should start by saying it’s not just “women’s only products”. Rather, we develop product that speaks specifically to the anatomical differences of women, and how that translates into the fit and ride of the bike. For example, our women’s specific mountain bikes are developed with more standover clearance to support the fact that the average woman is shorter than the average man. If a shorter than average male wants more standover, then it’s certainly possible he would fit a WSD (Women’s Specific Design) model better than the mainline models. It’s no secret that men and women are anatomically different. It’s also no secret that men and women, generally speaking, have different riding styles and preferences. We develop a wide range of WSD products to meet the majority of women’s needs. If you prefer a mainline model, that’s okay too. Every woman is different, and we develop product based on rider research and gender differences. Can you please describe the process you go through when developing a new women’s bike? Research: We start with the rider. Trek’s product and development team travels and talks to riders to find out what people need, what things aren’t working for them, and what they wish they had that they don’t. There’s also a lot to be gained just from observation. Sometimes people don’t realize they are making unnecessary compromises because the bike they have isn’t a perfect fit for them. Then, we create prototypes of things we are exploring and we have real people ride them and give us feedback. Lots of women rode lots of bikes to develop the Silque, Trek’s high-end women’s carbon road line. We ride again and again until we really understand what the rider likes or doesn’t like. Definition: Armed with our research, we begin to define what a new bike could be. What are the things our riders are expecting? What would delight them? What would be better than is currently available? Design: Now a larger group of people get involved to turn the research findings into a production worthy product. Sketching beautiful dream bikes, talking with manufacturing outlets, speaking with more riders, and eventually building something in the computer. Analysis: Comparing our lab test data and ride test data with the new bike data in the computer is an efficient way to get close to production before we begin testing real prototypes. Manufacturing: We now need to get the dream bike to become reality. The manufacturing process is complex and often needs to evolve along with our bike design. We are constantly challenging ourselves to make better, lighter, stronger, more comfortable bikes. Marketing: With a bike ready to sell, we tell the rider and retailer about the amazing new product that we have been working on for 1-3 years (depending on the complexity). Research continues: What can we deliver next? How long does it take from idea conception to product launch? Projects vary, but generally 1-3 years from idea to sales floor is about right. How significant is the women’s category to Trek’s overall business? The women’s product category (WSD) has always been really important to Trek. We’ve always put our chips into product research, design, and innovation for all our products and the women’s bikes and accessories are no exception. Our research and design efforts have led us to products that dial in the fit, ride, and style for the user. We get down to details in the design that most brands don’t bother with. That’s why we say, “The details make the difference”. Bikes like the Lush (MTB) and the Silque (road) are built from the ground up, and so many other great bikes that are outselling anything else available. Is there anything else you’d like to add about women’s products at Trek? I’ve talked a lot about our WSD line of products – which we are really proud of. Trek developed the first women’s specific products in 1999 to ever hit the market, and we continue to be ahead of the curve today. But beyond our WSD bikes, it’s important to remember that our Trek non-WSD bikes are also really great products for women. We love to see women shredding a trail on the Slash or zipping through the city on a Crossrip. For decades, Trek has been an amazing brand for women and it’s only getting stronger with time. Above all, seeing more women on bikes more often humbles us in a way that’s hard to articulate. At the end of the day, that’s really what it’s all about.